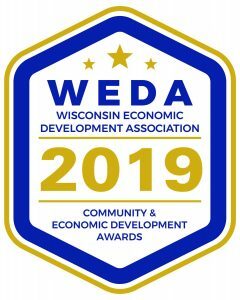 WEDA and its partner organizations created the Community & Economic Development Awards (CEDA) program to recognize economic development best practices of businesses and organizations that are making their community a better place to live and work. The CEDA Award program celebrates the dedicated efforts of local, county, regional, state, and private organizations that are advancing Wisconsin’s economy. The 2019 CEDA Awards will be held on September 11 at the Edgewater Hotel in Madison, WI. Don’t miss a unique opportunity to highlight your community’s exciting economic and community development projects. Please consider nominating an innovative project or forward-thinking business for WEDA’s Community and Economic Development Awards. Nominations close on June 1. CLICK HERE to see the 2015-2017 CEDA Award winners. NOMINATIONS CLOSE ON JUNE 1 Honors economic development programs that focus on retaining and growing businesses within communities and regions. Recognizes innovative projects that focus on economic growth within communities and regions. Honors initiatives or programs that can document successful workforce development outcomes. Honors innovative projects that demonstrate a strong public/private sector partnership or joint venture in planning, developing, and financing a project. Recognizes innovative real estate redevelopment or reuse projects that demonstrate measurable and quantitative impact on employment and tax base. Recognizes businesses for continued investment and job creation at their Wisconsin business operations.